With an abundance of child-friendly hotels and restaurants, Rhodes is well-equipped for a family holiday with babies and young children. The 30 miles of golden beaches and warm shallow waters along the east coast will provide an excellent location to enjoy Greece’s Mediterranean climate with your family; while many hotels offer kids’ clubs and babysitting facilities, also giving you the opportunity to enjoy some well-deserved “me time”, knowing that your child is being fully entertained. Away from the beaches, attractions such as Petaloudes (a privately managed butterfly reserve) and the waterpark at Faliraki are great for families. The largest of the Greek islands and steeped in ancient culture and amazing scenery, Crete is an island to suit children of all ages. Explore the underwater world with your teenagers through the many scuba diving courses, or take the opportunity to try windsurfing, paddle surfing or kitesurfing. If you prefer to stay on dry land, why not hire a bike and journey through the idyllic mountain trails and traditional villages. With the option of hiring baby seats, the whole family is catered for! Other options include Cretaquarium, one of Europe’s largest aquariums, the interactive Natural History Museum in Iraklio or come face-to-face with life-like prehistoric giants at Dinosauria Park! Frequent and direct flights make travelling to Greece’s greenest island popular with the Brits. Families will enjoy wandering the pedestrian-friendly streets of Corfu Old Town, while Aqualand in central Corfu provides an action-packed day out. For children from the age of six, Trailriders is a great way to try horse trekking on good-natured and gentle horses. Situated in the foothills of the Pantokrator mountains, you can enjoy the greenery of the olive trees and natural woodland, which provide ample shade during the hot summer months. The many beach resorts around the island provide plenty of opportunities for dining, water sports and even family-friendly nightlife. If island hopping is on your teenagers’ wish list, look no further than Páros. Lying centrally between the larger islands of Mykonos, Santorini and Náxos, this a perfect introduction to this fun and exciting way of travelling by ferry or catamaran between locations. Also within easy reach are the smaller islands of Iraklia and Koufonissia. Back at base, take time to enjoy the magnificent beaches, picturesque villages and traditional architecture, including the famous Byzantine Monastery of Ekatontapyliani – “the church with the hundred doors”. More suited to families with babies and toddlers, Halkidiki boasts unspoilt landscape and hills carpeted with wild flowers, and over 300 miles of beautiful white-sand coastline. Head for Sani, one of the most child-friendly and private beaches in Europe, where the warm and shallow waters are great for young children to explore the sea. Don’t worry about bringing your own bucket and spade – it’s all provided for you, and don’t forget to take advantage of the “babe watch” service! In Zakynthos, families with teenagers who like to socialise or those with younger children can both avoid the rowdy crowds of all-inclusive resorts, while still finding fantastic resort entertainment. Away from the resorts, visit the blue caves, which are only accessible by boat, or the sandy beach at Agios Nikolaos for organised water sports and scuba diving. 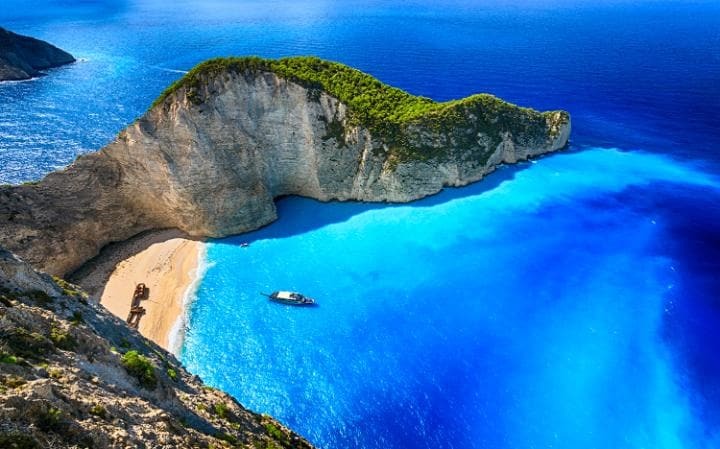 The island’s most famous beach is Navagio, or “Shipwreck”, and frequent water taxis from Porto Vromi allow tourists to experience this amazing landscape. This island is one of the top destinations for water sports throughout Greece, and is also connected to the Greek mainland by a small bridge. The likes of Kathisma Beach and Vasiliki Bay are prime locations for windsurfing and if you’re feeling adventurous try Nidri for inflatable water sports such as ringos and banana boats! For a relaxing change from the adrenaline-charged water sports, explore authentic Greece in the peaceful villages of the Sfakiotes region. Ready to head off to one of these amazing islands? Contact your Travel Counsellor to make your perfect travel plan!